This post is sponsored by Calico. I love sewing, so I am thoroughly enjoying showing you a project every week. I’ve got a big project for you next week, but this week is a small, easy project for a blue floral embroidery pillow. 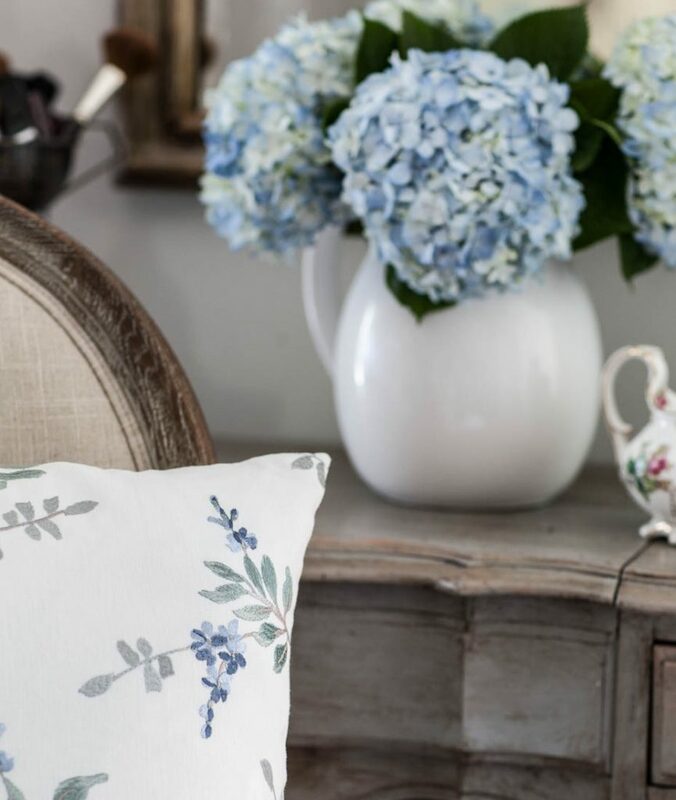 I love the idea of finding a gorgeous embroidery fabric and making just one or two pillows with the fabric. You only have to buy one or two yards to get a stunning edition to your room. If you used this fabric for a big project, it could get pricey, but just adding a pillow or two is very affordable, especially if you do the sewing yourself. I have an easy tutorial on making a pillow, and you can find it here. Pillows are easy to change out. If you love embroidery, you can find several fabrics at Calico that you’ll love. This fabric is called Mistral FC in color Chambr. CLICK HERE to see a selection of blue floral fabrics at Calico. I couldn’t find a link to this particular fabric, but you can order it from Calico. Just give them the name and I am sure they can order it for you. 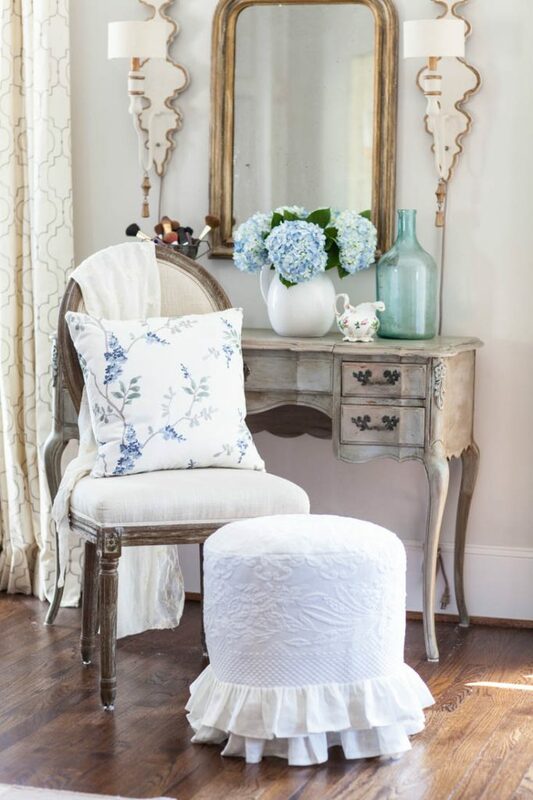 I have used blue and white throughout my home, so the great thing is that I can move this pillow around from room to room, when I need a fresh look. 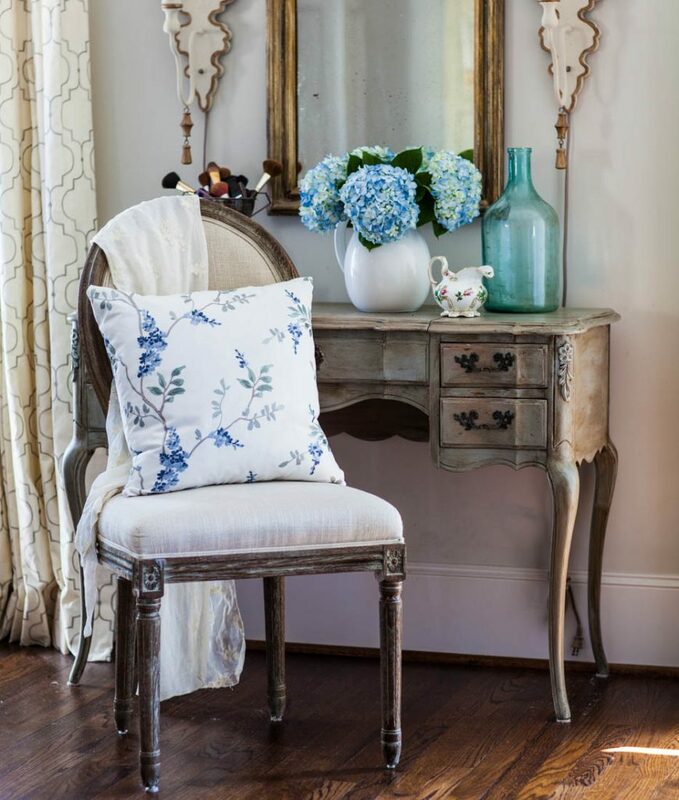 Add a few blue things next to the pillow to repeat the color, and you’ve got a great look. Today’s podcast episode is about how to add romance to your home. Listen below. I love showing the detail on the embroidered fabrics. This fabric is even more beautiful up close. If you don’t sew, there are some easy ways to make a no-sew pillow, or you can usually find someone to sew the pillow for you. Calico can even make the pillow cover for you, CLICK HERE for more information. 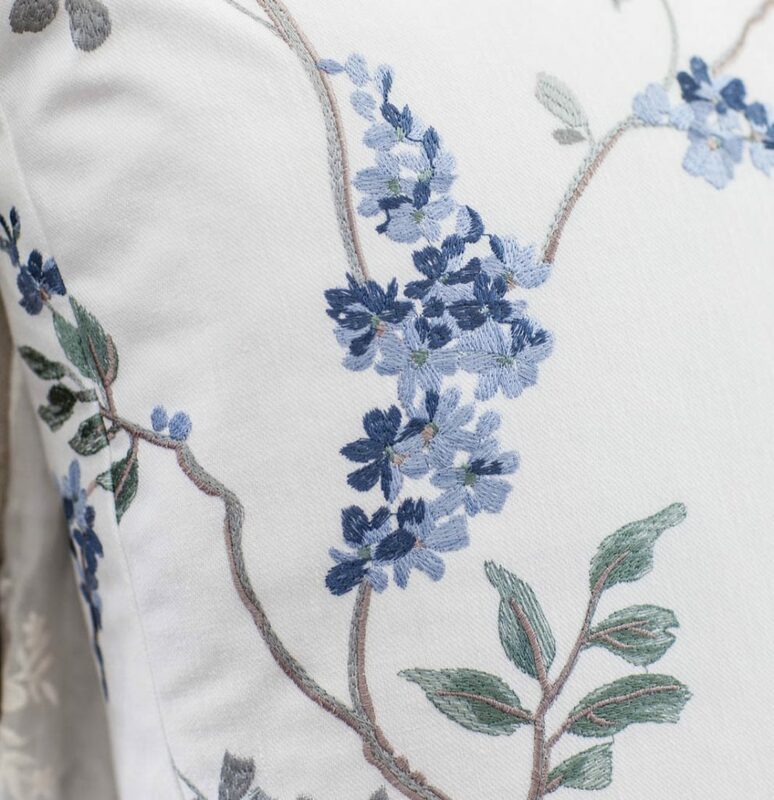 Speaking of romance, I think a blue floral embroidery pillow like this can really add some romance to a room. We had a dryer fire once and we also decided never to leave the house with the dryer on. I am a new follower of your blog. Love it!!!! So glad you caught the fire before any major damage was done. It is a terrible thing, fire. Your pillow is lovely. I also sew and love small touches in a basic decor to welcome New Seasons! Every summer I used to have someone go up the side of my house and clean the bird nest out of my dryer vent. Why the builder put it up so high on a single story home is beyond me, I’m afraid, but I’m stuck with it. Two years ago, I purchased a grated cover that keeps the birds out, so thought I was good. I’ve noticed this spring, however, that lint has gotten stuck in the openings of the grate so someone will still need to go up the side of the house to clean it out. The second part of that story two years ago, which actually precipitated my purchase of the grate, concerns the bird that came down the vent pipe and onto the floor of my dryer – unknown to me – and when I turned the dryer on, was caught in the motor, not only killing the bird, but burning out the motor – making the cost of repair more expensive than buying a new on-sale dryer. It was not a pretty sight when the back of the dryer was removed. Good advice to never leave home with the dryer running and also important – the fabric on this new pillow is absolutely stunning! So glad you were home to catch the fire. THANK YOU for telling the story because due to a hectic schedule I have been starting my dryer when I leave the house!! What a good reminder to slow down and be more sensible and cautious. Thank you! That is some lovely fabric! So pretty! Love, love the fabric and happy that the family, the house are OK….heard so many awful stories about dryer fires…. I love this fabric, the embroidery is beautiful. The fabric is gorgeous. Making a pillow is a great way to change the look and to use such luxurious material. Great & brilliant article. Just love this. So much informative also. Thanks for sharing. Keep it up.